Justin Hartman and the guys at Afrigator are at it again. I’ve wondered for a very long time why no one had created an ad network for African bloggers, thinking that there surely must be someone out there who wanted to advertise on some African blogs. Adgator is here to ask that same question, and prove it out. Make sure you read Justin’s post on the new platform. Afrigator recently had a sizeable stake acquired by MIH Print Africa, a division of Naspers Limited. This gives them more money to work with, and more credibility. This also means that they have a sizable sales team at their disposal, which is one of the biggest issues when doing an ad network. It’s a 50% revenue split with Adgator. You get paid on a CPM basis, so you had better have a good deal of traffic to make money. How do bloggers outside of South Africa get paid? At this stage we’re only piloting the program in South Africa. We need to test the viability of the program in the country where Afrigator’s largest base lies and if we can make it work here then we’ll take what we’ve learned into other African countries. When we do, we’ll most likely setup our own bank accounts in those countries so that we can facilitate the payment process from within those regions. One of the core issues we’ve always struggled with in the Adgator idea is the payment one and we realise that paying people from SA simply won’t work. Are you mainly focused on South Africa right now? Yes – we’re only SA for now. I’m hoping to roll this out to Kenya and Nigeria by March 2009. I know you have a sales team, how much of those sales are done outside of South Africa? None at this stage and herein lies the problem. Because we have little resources in other African countries it makes Adgator even more difficult to implement outside of SA. However, through our efforts with Afrigator we are working on overcoming this issue and establishing ourselves in our larger African countries. How many advertiser are already lined up? This is without doubt the most difficult aspect of the job as advertisers need to be educated in this process. That said it looks like we’ve got between two and four advertisers depending on how the final negotiations go. Charl Norman is one of the great examples of new media entrepreneurs coming out of South Africa. He’s has an amazing work ethic, showcased in a growing blog empire and three popular social networks. What Charl has been able to do in the last couple years should put the fire under any other web entrepreneur in Africa. He does quality work, finds hidden niches and works hard to promote them. 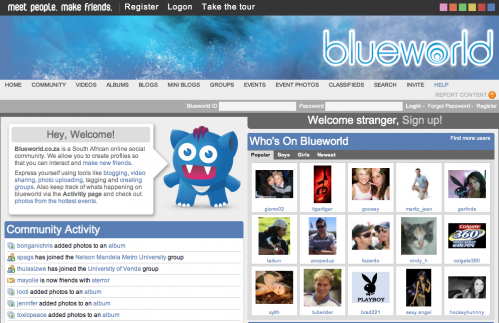 One of the social networks that Charl created was Blueworld, a social networking site for (younger) South Africans. Recently 24.com acquired a controlling stake in Blueworld for an undisclosed amount. That’s a big success story for a little startup, and one that gives Charl enough money to go do even more exciting things. Blueworld is a social community where anyone can join and create a profile so your friends can find you online, upload an unlimited number of photos, share videos, write your own blogs, support your peers with groups, send text messages to any network for free, discover new people and connect with friends. I remember when Blueworld first came out a couple years ago. Like many social networks, it was fairly simple and bare-bones. Looking at the most recent version though, you can see major changes. There are a lot more people using it, and the site is more robust. Like any other social network, once you gain enough users you have critical mass and the site grows on its own. With 137,000 registered users by March of this year, Blueworld is becoming quite a force in the web space in South Africa. By any measure, Blueworld is a resounding success story for Africa. A new paper by South African Gareth Knight that gives valuable advice for new entrepreneurs in the digital space. He’s the creator of Kindo, a family tree application. I’m really digging this new blog by a Nigerian named Loy. He’s covering some cool new apps by Nigerians, including CVCrib, which I plan on reviewing myself soon. An interesting article that discusses the challenge that young college-level entrepreneurs face in Africa.